Docker is a great technology which can be used for many purposes. One purpose for using Docker is to deploy WordPress. This tutorial covers deploying multiple WordPress websites on Docker. For this demo we are deploying etopian.com, replace that with your custom domain. The following is a quick tutorial for deploying your site on Docker. It has been tested and works with sites like www.etopian.com. It also supports using an SSL certificate. It uses Alpine Linux for serving the actual site, the beautiful thing is that a site can be served in around 50mb of ram. Using the process below you can deploy multiple WP sites on the same box, at least 10 sites on a 1gb VPS extremely securely as each site lives in its own container. This container uses Alpine Linux Edge with PHP7. We have found this to be a stable solution, despite being Edge being the testing branch of Alpine Linux. Our image on github. The process serving the website, Nginx and PHP-FPM, does not run as root. It's no less secure than running a non-root user like www-data to serve your site. If you can breakout to root within the container, you can potentially get to the host system. But that's absolutely no different than any other Linux system. If you break out of www-data on a normal setup to root, then you have root. See Why use Docker with WordPress for more. We do not use Docker's volume feature. Instead all files including the MariaDB data directory are bind mounted directly from the host. All your files are on the host in the /data directory. This helps with backups and is generally a safe way of dealing with files while dealing with Docker. Let's for instance assume that Docker fails to start and you need to rescue your sites. This way all your files including your database are in /data. If you would use Docker's volumes feature then you would not have any access to any of the sites files. All the NGINX config directories are mounted to /etc/nginx on the host for easy editing and management. Currently there is no process manager running in the WordPress container, not that this affects things much. We have it on our todo list to use s6 as the process manager. The nginx user is enabled on each container so you can bash into the container as the same user as the site, to use wp-cli. This is a minor security risk. Currrently there is no way to directly SSH into the container, you have to go through the host. There are no plans to add SSH to the container, you have to that yourself if that's something you need. Replace the tokens with their appropriate replacements. This sits in front of all of your sites at port 80 and 443 serving all your sites. 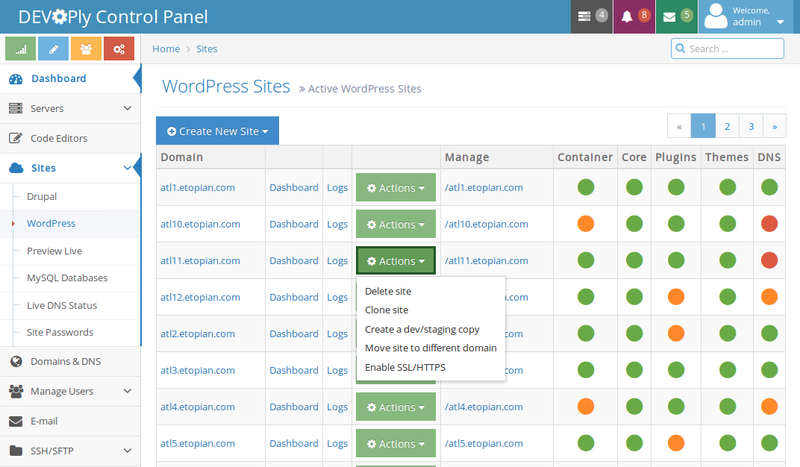 It was automatically reconfigure itself and reload itself when you create a new WordPress site container. Each site runs in its own container with PHP-FPM and Nginx instance. If you use SSL you need to run your container with the filename of the certificate you are using. Also check the wp-config section for information on how to modify your wp-config file if you are using SSL/TLS. In order to access MySQL/MariaDB running in a container you need a MySQL client on your host. You can alternatively using the client in the container, described below. #if you have a db, import it. if not then configure wp and install it using the interface. If you need to change the domain of the site put the follow in wp-config.php of your site. Your site should be working as long as the DNS entries are properly set. If you use SSL you need to run your container with the filename of the certificate you are using. So rm the existing container and recreate a new one with the following environmental variable. edit wp-config.php in your site's htdocs directory. Mail is not routed by the container, you must use an SMTP plugin or Mailgun or AWS SES to route your site's email. The reason that mail is not routed is because configuring mail to route from the proper domain on a server is often a headache. A further headache is actualty getting mail delivered from an arbitrary IP. A third issue is that mail servers consume resources. A fourth issue is security. So for all these reasons we decided not to implement mail and instead delegate that task to various providers like Mailgun. Mailgun WP Plugin works fine in the container but the test to see if it is working will fail because it does not correctly set the e-mail address before attempting to send an e-mail. Simply ignore the error, and test the mail from your actual site to make sure it's working. You can view the logs of all your sites using the NGINX proxy container. If you want to view logs for an individual site, they are in the logs directory on your host. WP-CLI is included in the Alpine Linux image. To use it from inside the container in a safe way. It is possible to speed up your site with Redis... You need enough memory to support Redis obviously. Put this in your wp-config.php below the DB_HOST and DB_NAME entries. Go to your site's dashboard and activate the Redis object cache. Settings > Redis and click the button to activate. You may fork it and modify it to add additional modules and what not. List of available modules in Alpine Linux, not all these are installed. docker exec <container_name> apk update #do this once. DEVOPly is a hosting control panel which does everything taught in this tutorial automatically and much more, backups, staging/dev/prod, code editor, Github/Bitbucket deployments, DNS, WordPress Management. http://www.devoply.com! You should also deploy a firewall on your box. However, it's very easy to lock yourself out of your box, so I will not give you exact instructions on how to do it. The following is what I use for my box using arno-iptables-firewall. Docker DOES NOT own, operate, license, sponsors or authorizes this site. Docker® is a registered trademark of Docker, Inc. Similarly, WordPress Foundation DOES NOT own, operate, license, sponsors or authorizes this site. WordPress® is a registered trademark of WordPress Foundation. wordpressdocker.com Unofficial WordPress Docker Tutorial is not affiliated with Docker, Inc or WordPress Foundation. This site is a not for profit tutorial made available free of charge.